Once you go bacon, you won’t go back. What breakfast food is better than pancakes? BACON! What’s better than bacon? Bacon filled pancakes of course! 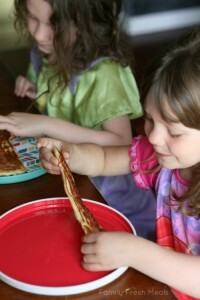 You won’t believe how easy these special pancakes are to make. Once you go bacon, you won’t go back. 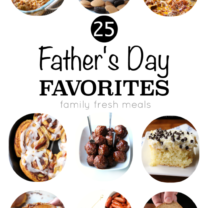 P.S Bacon Pancakes = the perfect Father’s Day breakfast 🙂 YUM! 1. Start by mixing together pancake mix, eggs and milk. Whisk until most lumps are gone. 2. Heat non-stick skillet using a medium/high heat. 3. To prevent any sticking and to add flavor, I prepare my skillet with a little butter. 4. 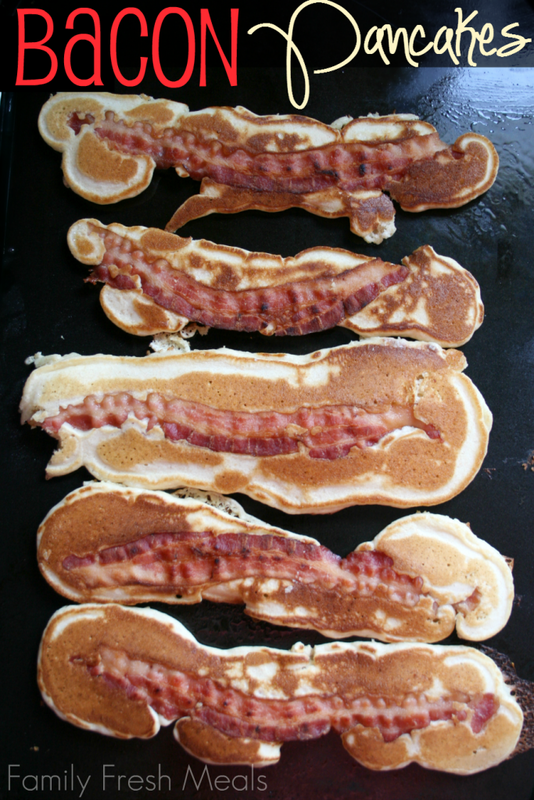 Place bacon slices on skillet and then top with pancaked batter until bacon is covered. 5. 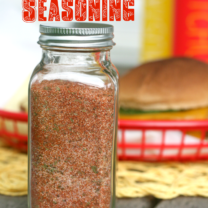 Cook until top is bubbly and edges start to dry. Flip and continue cooking until other side is golden brown (about 45 seconds-1 minute). Serve immediately. Start by mixing together pancake mix, eggs and milk. Whisk until most lumps are gone. Heat non-stick skillet using a medium/high heat. To prevent any sticking and to add flavor, I prepare my skillet with a little butter. 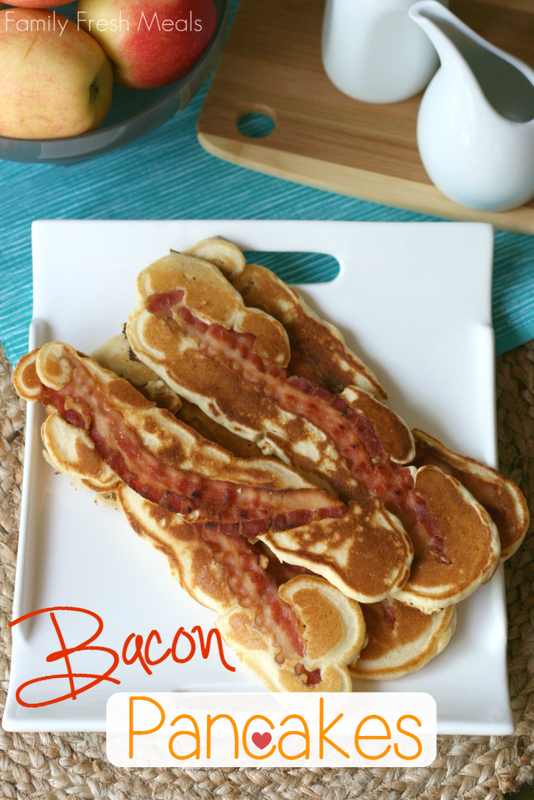 Place bacon slices on skillet and then top with pancaked batter until bacon is covered. Cook until top is bubbly and edges start to dry. Flip and continue cooking until other side is golden brown (about 45 seconds-1 minute). Serve immediately. 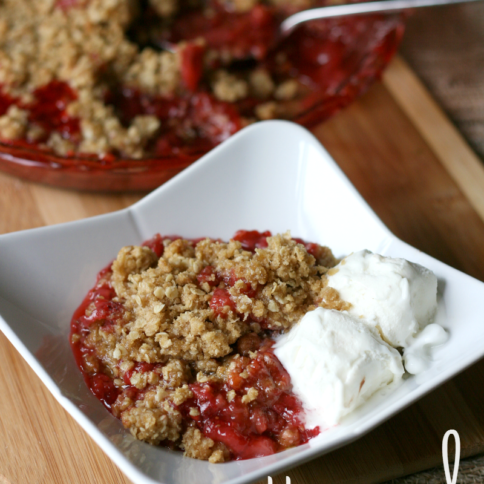 Homemade Strawberry Cobbler and A Chance to Win Your Own LG EasyClean™ Double Oven Range! oh my goodness! My husband is going to love these!!! Oh good 🙂 They sure are yummy! They look and sound yummy!!! These are so cute, going to make them this morning. 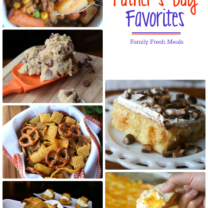 My boys will love them! I made these and they were fabulous (my daughter termed them “heaven”), but I had to modify the technique quite a bit. 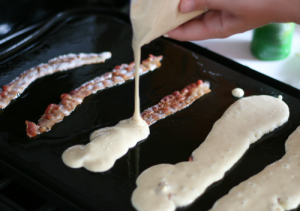 Instead of pouring the batter over the bacon, I poured a “bed” of batter for each bacon, immediately pressed a strip of bacon into that bed, and then turned the pancake once it was really set. 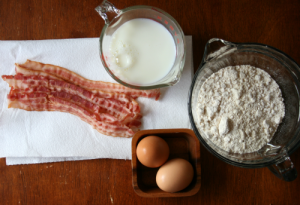 When I used the method described in the above recipe, the part of the batter that rested on top of the bacon strip never solidified enough to be able to turn it without it simply falling apart.